Some animals come into our lives unexpectedly, and leave the biggest footprints. Big Bird was one of those animals to me, and him passing away today has been so very sad. He was truly my buddy, ever present in my barn life for the past 5 1/2 years. I aquired Big Bird in the summer of 2011. The year before I had lost our farm rooster, Eggnog, also a handsome buff orpington, to old age, I believe he was 7 or 8. Big Bird, like Eggnog, was a Tractor Supply pullet (he was purchased to be a laying hen) that a friend of mine offered me as an alternative to her “putting him in the pot”. 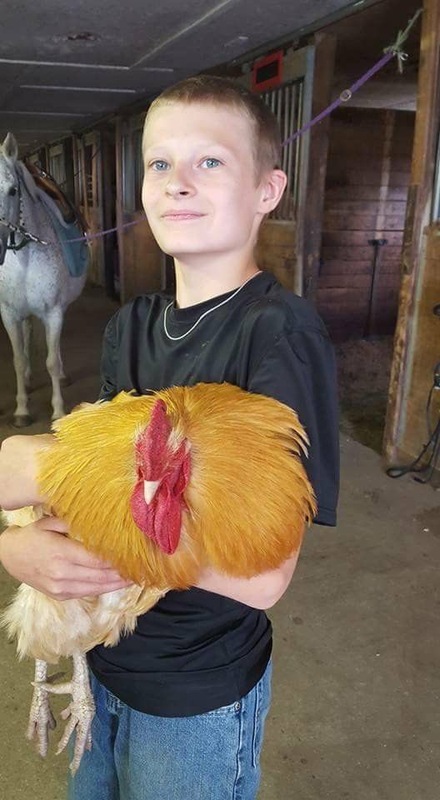 I couldn’t resist; he was my 3rd domestic barn rooster, and the kids and I have made pets of them all. Big Bird himself had 2 near death experiences; one before adulthood that resulted in him being unable to fly, ever. We found him one day with a terrible bloody wound to his back and a huge patch of feathers missing. 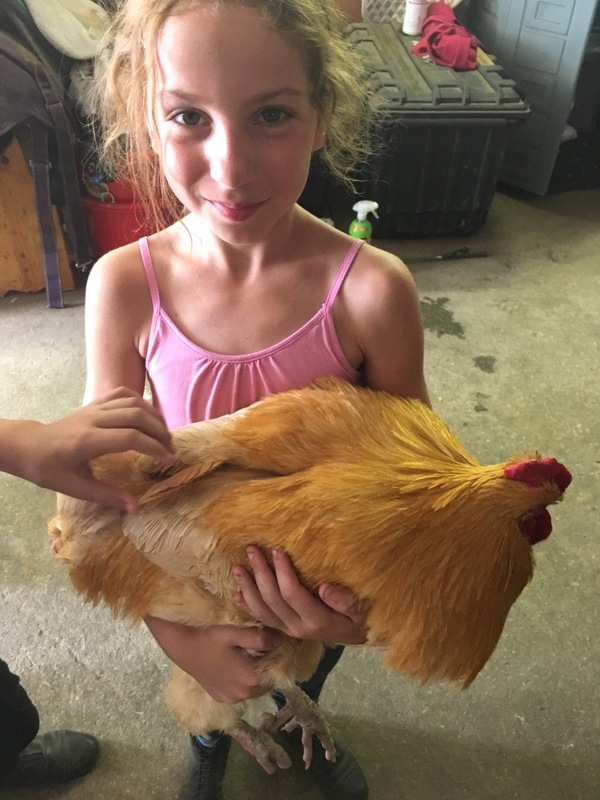 It appeared that it might be fatal, as he was pretty badly injured, and then it got infected—but what do you do with a farm rooster in that condition? We treated his back with Super-H, and he got better. I think he had an encounter with a hawk, or some other arial predator. He never went far from the barn, and never would go out far in the open after that. Because he could not fly, he was never able to roost with the other chickens, sadly, but he bedded down every night in the hay stall, and that was his place. The Dually Hen flew up above with the others, but at a year old we found her lifeless body below the roost; apparently she had fallen off during the night, and due to her size she sustained a non-survivable injury. Big Bird was then the lone domestic chicken in the barn in the company of bantys. He never seemed to care though, and when I got my flock of domestics in the spring of 2015, he had absolutely no interest in joining them, despite my repeated attempts. 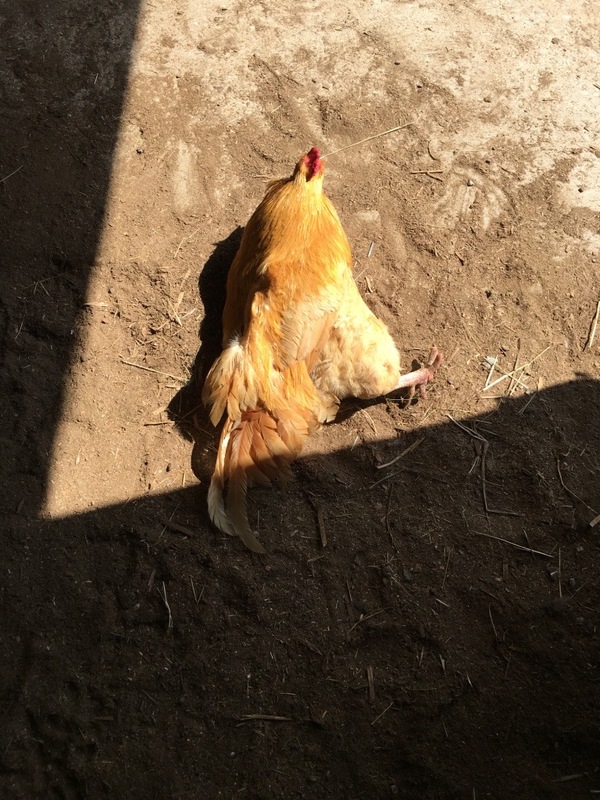 Big Bird had his own little life to live in the barn, and he lived it fully! In the short 5 years of his life, Big Bird became a Horse Amour icon. Above was one of his favorite places, the open door of the arena, a favored location for his dust baths. He was vocal. He crowed his “Happy Day, I’m King of the Barn” all day, every day. 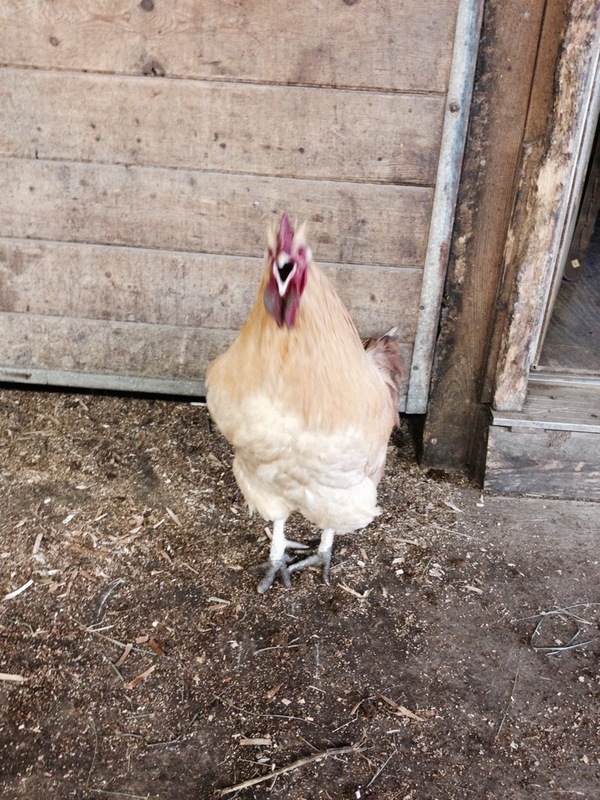 When not crowing, he walked around the barn talking; either clucking softly or growling. 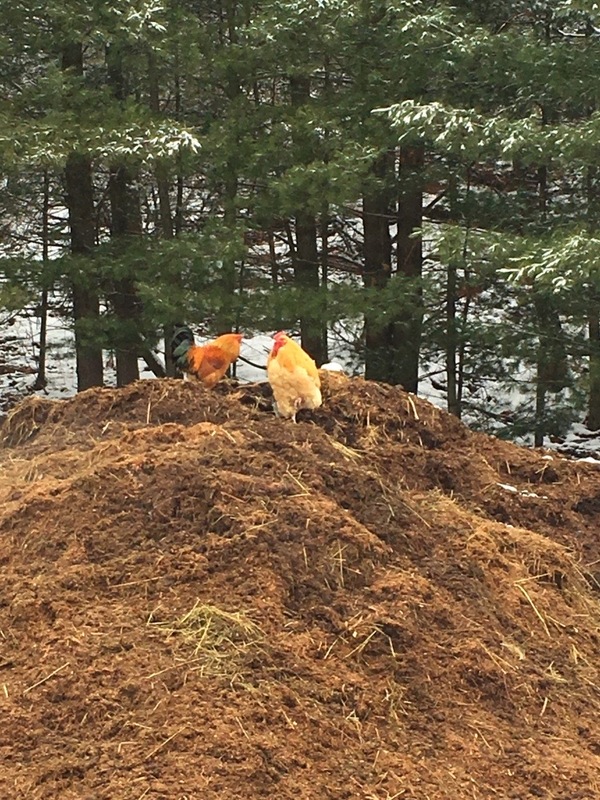 The top of the manure pile, perfect place to crow over his kingdom. 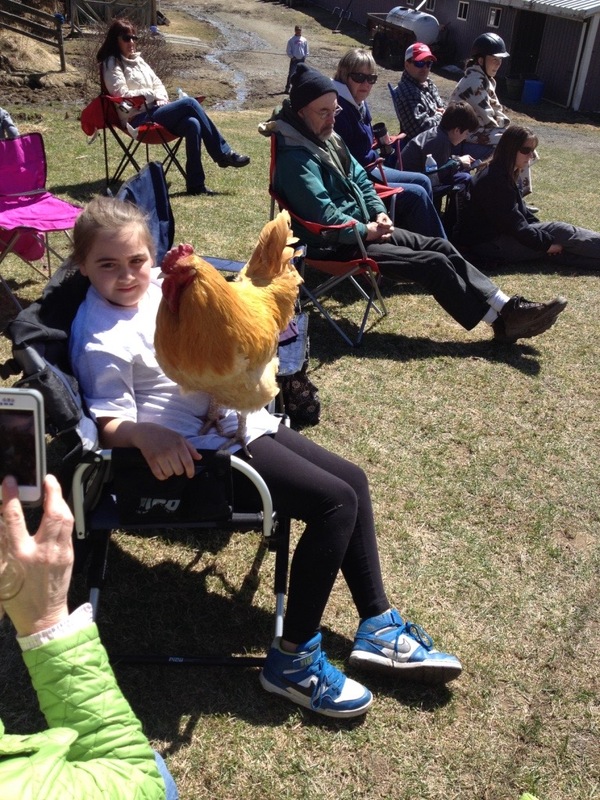 He was remarkably tolerant of other roosters, and was usually in the company of one or more banty roosters. Sometimes they would stand head to head, as if sending telepathic thoughts. When the big arena door was shut, he could be found in the doorway to the aisle, on a cold day. Soaking up the sun and waiting to greet any entering human. So many people over the years have commented on my friendly roosters. Big Bird was by far the friendliest of all. Maybe because he always had positive human attention. Maybe because children handled him frequently. Maybe all the hand fed treats. Whatever the reason, Big Bird loved people. He would come running awkwardly if anyone called his name. Big Bird is in the background of many dressage photos, and his crowing is in many musical freestyle videos. When the shows were inside, he positioned himself always, near the judge at C. When the shows were outside, he worked the crowd. A couple of winters ago, Big Bird sustained his second near fatal injury. Billy’s dogs escaped their kennel, and killed my only remaining laying hen Buffy, offspring of Eggnog and a banty, she looked like a buff orpington, and was relatively tame. Big Bird was no where to be found, though he was always with Buffy, who lay dead in the yard. I found a huge pile of his feathers, which appeared to be his entire tail, but no bird. I was heartbroken, and furious, I have never felt more anguished about an act by an animal or worse ever about my own negligence that would cause my gentle friend such a terrifying experience, or worse, death. I looked everywhere, called and cajoled for 2 days. I had a sinking feeling walking to the barn every morning, and not seeing my friend in the doorway, and then running down the driveway to me as he did on a daily basis. I couldn’t sleep, and felt sick inside. Then we had a terrible snowstorm. Bitter cold, and at least a foot of snow. My horses are pastured with a feedlot for round bales in the southeast corner of my parking area, and they have to walk up and over the hill to get their water from a tub at the northeast corner of the barn. Strangely, they were spooking and snorting up at the top, for several days in a row. The spooking continued, until one day even brave Bubba would not come over the hill. Billy went up to investigate, and returned with a half frozen, but very much alive, Big Bird. I’ve never cried so many happy tears as I did over that bird. I didn’t realize until he was gone, how much I really enjoyed his presence in my life, and his constant companionship. 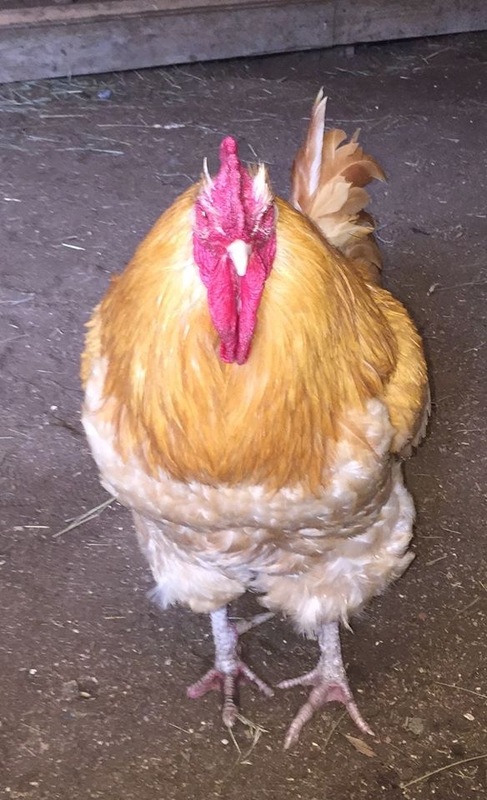 He had severe frostbite, and ended up losing his toes on one foot, and a good part of his handsome comb and wattles. After that, his gait became even more goofy and awkward. Until this past fall, if I was in the barn area, Big Bird was there. He was always in the indoor if I was teaching inside. He would come up to the dressage ring when I was out there. Maybe it was the arrival of Scotch, or maybe his age that made him less present in the arena this year, although he was not in the least bit afraid of Scotch. I definitely started to see some signs of aging; he didn’t meet me in the driveway as much. He would still be in “bed” some mornings, and he was quicker to go back to bed in the middle of the day rather than being everpresent in the arena. But his crow was the first thing I heard when I stepped outside. I could hear him from the house, and always listened for that crow when walking out to my fancy coop, where I take care of my domestic chickens prior to going up to the horse barn every day. The cold was hard on Big Bird. I had hoped that he would want to be with my 10 laying hens, that live in a beautiful, safe, clean and warm coop next to our pool, but although he would visit, and briefly beat up the little Roo that lives there, he would gallop awkwardly across the meadow and back to his life at the barn, every time. This winter the cold really bothered him. I could see him experiencing pain in his damaged leg, and his wattles became swollen during the first cold snap. He didn’t seem to be able to see well. My lessons were cancelled due to the bitter cold yesterday, and the kids volunteered to do the chores so that I could do some much needed housekeeping, and I did not go to the barn. All night last night I worried about him in the bitter cold, and this morning found him hypothermic. He acknowleged me, but was not able to rise, and tucked his head under his wing instead. I hooked up a heatlamp over his bed, and did chores. After chores, I picked him up and carried him into the bright sun, I could feel then that he was either going to revive quickly, or pass away within minutes. I carried him to his favorite place in front of the arena, told him how much I loved him, and felt the very moment he flew over the Rainbow Bridge in my arms as my tears spilled on his beautiful feathers. With every special animal that passes, I lose a peice of Horse Amour. Big Bird, in his “little” life here, was truly big. Everyone knew Big Bird, although his entire world barely spanned 100 yards. Children that were previously afraid of birds, held him in their arms. They marveled over his huge spurs, scaley massive legs and claws. They felt his warm wattles and stroked his fine plummage. Many students regularly brought him goodies, and looked for him eagerly upon arrival at the barn. He had a job here. He spook proofed horses, cleaned up after our concessions and interrupted many of my sentences over the years with his crowing. He was a great companion, and I know he was fond of me too. It’s wonderful, this farming life, how unlikely friendships develop and grow between human and animal. I will miss Big Bird forever.